Christopher Hitchens was diagnosed with cancer less than a year ago, and tells us in this CSPAN interview that his disease has unfortunately progressed to stage 4. How he is facing cancer, and how he is facing death, is a topic he addresses with the same candor, wit, intelligence and realism that has been his trademark style for the better part of three decades. This interview is 53 minutes long, but if you can spare the time I strongly encourage you to watch it. 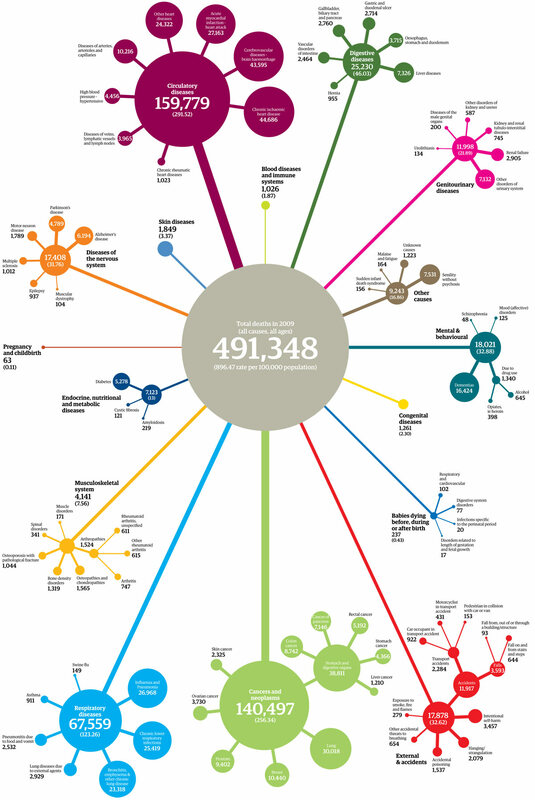 This graphic illustrating every cause of death in England and Wales was published in The Guardian. The data comes from the British Office of National Statistics, and it’s similar to data from the US Centers for Diseases Control. Click for the full-size image. About 2.5 million people have spent $25 or more on a little rubber bracelet called Power Balance. Perhaps you’veheard of it (or are wearing it). Its makers claim that it “resonates” with the body’s “energy flow” producing extraordinary balance, flexibility and strength in its users. Well, at least that’s what they used to claim. Now, in a show of candor rare among hucksters (unless they’re being threatened by industry watchdogs, which they are), they’re admitting that the product isn’t backed by an iota of credible scientific evidence. They’ll even send you a refund if you feel you were duped by their advertising. Everything in nature has a set frequency. The body has a frequency and things which cause negativity to the human body – like mobile phones and radio waves – break down its natural healing frequency. My brother and I worked out a way of putting good frequencies into our holograms so they balance out the body, making it stronger and more flexible. It works in different ways for different people. Athletes say they can last longer on the field, that they have better balance and that their muscles recover quicker. Non-athletes say it works for them, too, giving them that extra boost off the field, in many areas of life including the office and in the bedroom. The holograms he’s talking about are identical to those on your credit cards, but evidently you have to use the Power Balance brand of holograms to “balance out the body.” Suffice to say this product is as much a sham as magnet therapy and crystals that align your Chakras. And it once again teaches us a lesson that so few people seem to ever learn: we are more gullible than we’d like to believe, and we’re easier marks than we’d like to admit. If you were one of the millions duped by Power Balance, don’t feel bad. CNBC named it their “Sports Product of 2010”–an endorsement taken seriously by a whole lot of people. Many of those people also get most of their financial advice from the same source (might want to rethink that, by the way). Celebrities who use and endorse the product include David Beckham, Robert DeNiro, P Diddy, Khloe Kardashian, Shaquille O’Neal, and (gasp) the new princess, Kate Middleton. But, alas, the pseudoscience song remains the same no matter how many stars or royals get pulled into singing it. Products that seem to work via mysterious means inaccessible to scientific investigation are more than likely bullpucky and always have been. Their makers have always used sophistry and fuzzy explanations to sell them, and have always relied on the power of suggestion to propel the pucky as far as it’ll go. The game never really changes; the shysters just develop craftier ways to circumnavigate our judgment and appeal to what we really want — an easier way to feel better, look better, and be better. How Many Red Bulls Would Kill You? The folks at Energy Fiend have developed an online calculator called “Death by Caffeine” that tells you roughly how many Red Bulls, Monsters, Rock Stars, etc you’d have to drink to keel over. The number of drinks you can choose from on the killer-drink drop down menu is staggering, but upon closer inspection it looks like they include regular sodas like Pepsi, Coke and the like along with the amped up drinks (and even energy mints and coffee ice cream). It would take 204.75 cans of Red Bull to put you down. Gulp down 474.78 cans of Coca-Cola Classic and you’re history. You could drink 297.82 cans of Mountain Dew before croaking. It would take 109.20 cups of Starbucks Tall Caffe Americano to put you down. If you eat 341.25 Cups of Haagen-Dazs Coffee Ice Cream, you’ll be pushing up daisies. By the way (and I say this as a die-hard coffee drinker), imbibing caffeine to stay awake is one of the silliest things we humans do. The reason is this: in the brain, caffeine acts as an antagonist (a blocker) of adenosine–the neurotransmitter that pushes us closer and closer to sleep until we nod off–and it’s very good at accomplishing this. The problem is that with less exposure to adenosine, we become even more sensitive to the neurotransmitter’s effects. If we reduce our intake of caffeine, or simply become more tolerant of it, we actually find ourselves becoming more tired. So then we jack up the caffeine to counteract the withdrawal, but that just increases our tolerance. Takeaway: you can only fool your brain into not sleeping for so long before succumbing to the inevitable crash.